Local funders support capacity-building and long-term sustainability in ʻāina-based community efforts. One of forty participants from 25 ʻāina-based organizations across the state who gathered last month for a three-day workshop on administrative capacity-building, Cramer is familiar with one of the questions that has brought these community members together: How can we sustain the work for the next generation? 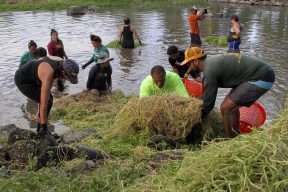 In addition to hands-on stewardship work, grassroots communities across Hawaiʻi work hard to build up, sustain, and manage organizational foundations in their efforts to care for Hawaiʻi and her natural resources. The Kaʻa i ka Lawa workshop, which opened on September 21 at Camp Mokulēʻia in Waiālua, Oʻahu, was organized by local non-profit Kuaʻāina Ulu ʻAuamo (KUA) and sponsored through the Office of Hawaiian Affairs(OHA) ʻAhahui Grant Program, with some additional funding from Kamehameha Schools (KS). “Our work could not progress without the collaborative spirit and support of forward looking organizations like OHA, KS, and the Castle Foundation,” said Kevin Chang, Executive Director of KUA. “These funders believe in empowering the roots of our community, the kīpuka, or rural areas where much of traditional cultural knowledge remains. Through small breakout groups, plenary sessions, and Q&A with professionals from OHA, KS, the Castle Foundation, and the Hawaiʻi Alliance of Nonprofit Organizations (HANO), participants were able to exchange ideas, share experiences, ask questions, and seek out information on a range of topics including volunteer coordination, insurance and liability, and funding strategies. The capacity-building workshop was intended to provide the space and time community members needed to discuss administrative aspects of their ʻāina-based work and to collectively think about how it can be applied to resource management in Hawaiʻi. Through these types of networked gatherings, community members are also able to empower each other, share challenges, lessons learned and seek pathways to overcome systemic barriers together. “We believe it is in the kīpuka, when nurtured, that the seeds to heal our island’s lands and waters and improve our quality of life will best germinate,” says Kevin Chang of KUA. The Kaʻa I Ka Lawa workshop brought together three intergenerational networks of families, practitioners, and organizations actively engaged in malama ʻāina (the reciprocal practice of caring for and using natural resources), loko iʻa (fishpond), and limu (native Hawaiian seaweed) restoration efforts across the state: E Alu Pū, Hui Mālama Loko Iʻa, and the Limu Hui. As a 501(c)3 with a 15-year history of providing strategic capacity-building support and movement for community stewardship efforts, KUA’s primary mission is to empower communities to improve their quality of life through caring for their biocultural heritage. For more information on the networks of E Alu Pū, Hui Mālama Loko Iʻa, and the Limu Hui, visit: www.kuahawaii.org. LAWA: enough, sufficient, ample; to have enough, be satisfied. Lawa pono, plenty, abundant, ample, adequate. 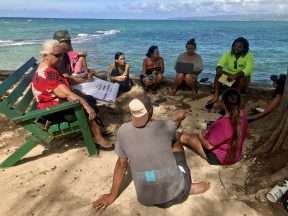 * A version of the below article was first published in the November 2018 issue of Ka Wai Ola under the title “Local funders support capacity-building and long-term sustainability in ʻāina-based community efforts.” (Source: KWO, Nov 2018, Vol. 35, No. 11). This entry was posted in E Alu Pū, Hui Mālama Loko I'a, Limu Hui, Workshops. Bookmark the permalink.